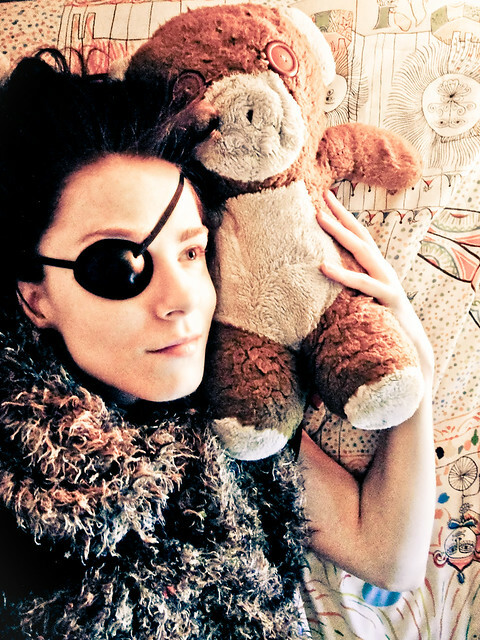 I am often asked why I wear an eyepatch, why I use a cane, and what is actually wrong with me. Here’s a breakdown of how my genetically compromised health has manifested over time. I was born three months premature, weighing two pounds six ounces. Doctors tried to slow my birth by giving my teenage mother an IV of alcohol. It didn’t work (probably because prolapsed uteruses are common on my mother’s side, but I’ll get to that). I had a 5% chance to live, thought to be assuredly blind or brain damaged if I survived. I was so small, my grandmother sewed me baby clothes out of doll patterns. I ended up being neither blind nor brain damaged, and was instead a tiny brainiac, starting to read at age three, always reading far above my age level, and was considered for moving up a grade or two. I banged my tailbone on a playground ride, the sort that’s solid metal with a bouncy spring-coil, and hurt myself so badly I could hardly walk. I did it two years in a row at the annual end-of-the-school-year party. According to adult X-rays, it evidently fractured and is now bent inwards right there at the bottom of the Xray (which may indicate i’ve got Tethered Cord Syndrome). Obsessive Compulsive Disorder kicked in during childhood, and I rearranged the furniture of my bedroom on a monthly basis by laying on the floor and pushing the furniture with my feet. I fell off a swing and fractured my sternum and some toes when around six years old. Years later, I fell off a swing onto my neck, had to be wheel-chaired off the playground, and was brought to a chiropractor for treatment. At some point in grade school, scoliosis was discovered, and I was brought to chiropractors once or twice a week for massage and adjustment. A surgeon said that surgery would be purely for aesthetic reasons. My shoulders, when rolled, made such audible grinding sounds that they were heard across the room. I’d do it to gross out the other kids in acting class. My ankles, too, made such popping sounds that one night when I couldn’t sleep and was spinning my ankles, my mother burst into my room thinking there was an electrical fire. I developed chronic swollen tonsils and lymph nodes. I missed an entire semester of gym class due to tendonitis in one of my heels. Weight gain and fatigue started when puberty struck (I found out at 29 I have Poly Cystic Ovary Syndrome and Insulin Resistance). 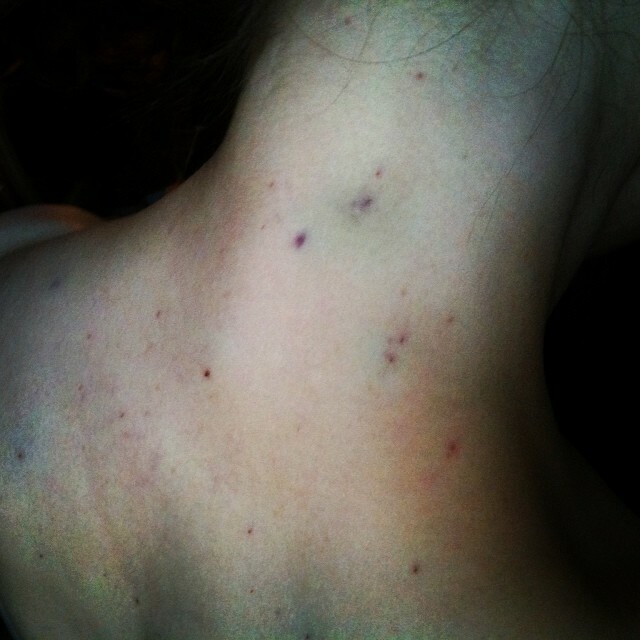 The constant pain around/under my right shoulder blade started, and has never gone away since. (I don’t remember what it feels like not being in pain.) Parts of the muscle by the right shoulder blade went somewhat numb to the touch. Masseuses at the chiropractors made note of my many muscle spasms in my back. I was sick with and tested positive for mono twice. I developed a heat intolerance that continued to worsen throughout my life. Hot weather makes me weak, lightheaded, shaky, and sometimes pass out. Trichotillomania surfaced, which is an OCD/Tourette’s related disorder that makes an individual compulsively pull out their own hair. 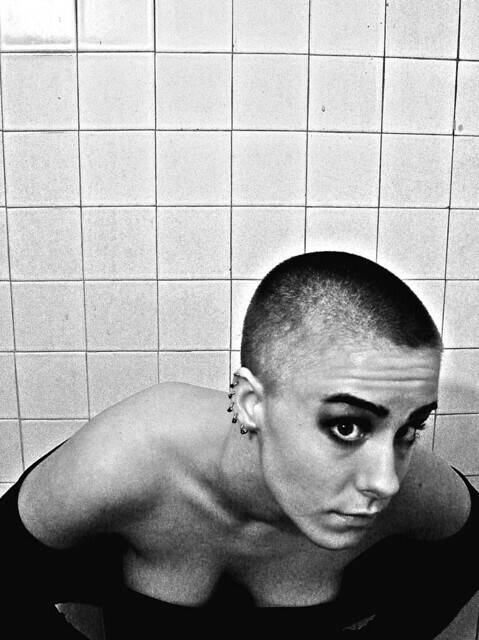 (OCD, Tourette’s, and Trich all run in my family) This is why I periodically have cut short or shaved my hair as an adult; to stop from pulling my hair all the time. It’s exhausting and very stressful. I started to get more scatterbrained, less focused. Panic attacks started. I briefly went on the birth control pill, but my PCOS was undiagnosed, and the combination of the type of pill I was on and my hormonal imbalance caused SEVERE depression and weight gain. At the same time, my right eye started to turn inward leaving me crosseyed for a reason that doctors have still not yet fully explained. (Between the seeing double, the panic attacks, and the depression, I thought I was literally going crazy and dropped out of college – there is some precedent for mental instability in my lineage.) Eye muscle surgery in my mid twenties helped me appear far less cross-eyed, but my eyes still do not work together and I still always see overlapping images. I eventually got prism glasses, but still had trouble with double vision. A new chiropractor looked at my X-rays. On my first visit, she told me I have a wedge shaped vertebrae. Nobody had noticed it before?! My right arm began to constantly ache and burn. My hands and feet started to cramp shut if I used them too much. Neuropathic pain descended on me, leaving me with agonizing stabbing pains and pins and needles and generally feeling like I’d gotten ground glass in my bloodstream. I would end up curled up in bed in pain, and nothing worked. Doctors didn’t believe me. My hands and feet got it the most, and always the right side was worse. My drawing hand started to hurt and not work well. I started to get varicose veins, and a perpetual aching in my right calf. My hirsutism increased, and I began growing a goatee, needing to wax my face twice a week, or shave daily. Some doctors told me I had a heart murmur. Some didn’t. I’d been tested for MS repeatedly, and given a spinal tap to test for Lyme Disease. Tests always come back negative, and doctors started referring to me as a “mystery case”. My right arm was beginning to be noticeably weaker than the left, especially the hand. Drawing continued to be more and more frustrating, until I mostly stopped in my mid twenties. Because it would invariably make me cry. When I got new Xrays and MRIs taken, the techs often assumed I wasn’t born in this country, because of the condition of my spine. I’ve got sometimes three, sometimes five, sometimes more bulging discs; sometimes spondylolisthesis, sometimes stenosis, sometimes plain old arthritis. It all depends on the quality of the scan and report, and how seriously the doctor takes me. I sent my MRIs to The Chiari Institute. (A Chairi Malformation is when the back of your brain slides out of the hole at the back of the skull and gets everything squooshed.) They wrote back and said I was a candidate for corrective surgery. They did not take any insurance aside from Medicare. So, I applied for Disability to get Medicare so I could finally fix my health. After being tested for it repeatedly, I finally did contract Lyme Disease while living with my aunt in New Jersey. Yup, on top of everything else. I saw the bullseye rash and thought, “oh no, Lyme Disease!” and then dismissed it as my being alarmist and hypochondriacal, because I’d internalized everyone else’s disbelief of my completely legitimate health issues. Then the Lyme Disease fully blossomed and made every symptom I’d ever had flare, and I was a complete mess. My worst symptom was a perpetual headache at the back of my head, a pressure that was only made bearable by laying flat on my back. I was literally bedridden for some time. I couldn’t be upright for more than fifteen minutes. Antibiotics improved my condition almost immediately, but the pressure at the back of my head has remained ever since, waxing and waning based on external factors like stress and weather and having a constant feed of antibiotics. The Botox shots every three months in addition to the twice daily Doxycycline is the only thing that somewhat keeps the perpetual head pressure at bay, and just barely. My attempts to taper down the antibiotics bring back the head pain almost immediately. While I’ve managed to just barely rid myself of the constant pressure, chronic migraines are now a part of my life, never knowing when one might strike. The weeks of being trapped laying down finally inspired me to start using an eye-patch, which initially was only so I could watch movies while laying on my side, but soon realized it dealt with the double vision much better. I finally got approved for Disability, which took three years. As soon as my Medicare kicked in, I once again sent my records to The Chiari Institute. They’d changed their insurance policies since then and had been involved in some lawsuits. This time, they said I wasn’t a candidate. They didn’t say why. The years since then have brought with it body pain – “fibromyalgia-like” pain is what my doctors call it. Everything hurts. Every movement. Laying in bed looking at my phone is too painful for my arms after a few minutes, as is styling my hair. Climbing stairs causes the same kind of searing burning pain in the tops of my thighs. Being on my feet for any duration makes my feet throb in terrible pain for days afterwards. I can often hear all the bones of my feet shift when I stand. I’ve started using a cane. I am often dizzy, it helps me in the effort to climb stairs, and it’s a good signifier to others that I am not normally-abled. It was only in the past few years that was finally diagnosed by a geneticist with “probably some sort of” Ehlers Danlos Syndrome, which is a collagen production error. It creates faulty collagen, which part of just about everything in the body that isn’t bone or muscle. My collagen is stretchy instead of strong, so I’m less prone to wrinkles, but hyper prone to stretch marks and to the prolapse and rupture of internal organs (which explains why I was born prematurely; pelvic organ prolapse is quite common in some types of EDS). All my parts are not kept in place well, so my joints and spine slide around more than is normal. Also, since that which is supposed to keep me connected is weak, my muscles compensate by working overtime, which is why my back has been a mass of spasm and knots since I was in grade school. 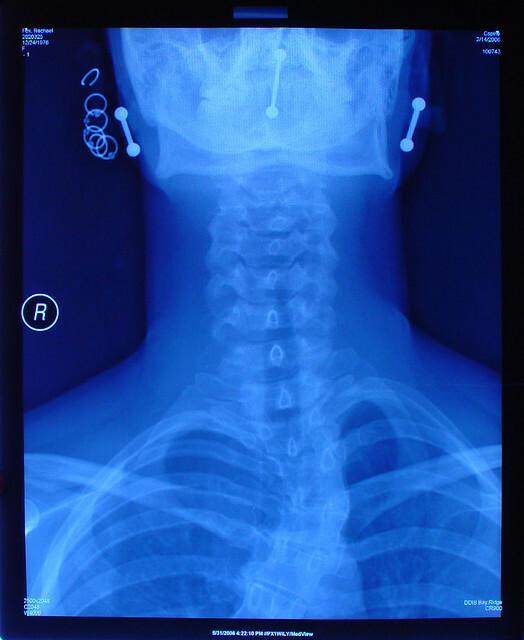 Chiari Malformations are very common in people with Ehlers Danlos Syndrome, as is cervical spine instability, because the neck is so unstable it often collapses under the weight of the skull. EDS also causes Postural Orthostatic Tachycardia Syndrome (POTS), because the blood vessels don’t stay taught enough to keep my blood where is should be, and it all rushes to one’s feet when they stand. This is likely why I’ve had heat intolerance, and why I now often get very dizzy if I stand to fast. I’ve had a few instances of passing out. My internal organs are starting to get out of place and stretchier than they should be. My right hand is smaller and weaker, my right foot painfully numb, my right eyelid is slow, the right side of my face is starting to droop. It’s subtle, but it is plainly visible. I’d had a neuro-psych evaluation two years ago, which took a few days and many many hours. I was told that my cognition is significantly impaired, and that the reason it was never caught before is because I used to be smart enough that a significant decline in my cognition still kept me within average ranges. However, without even using a sliding scale to take that into account, my memory is below average, and my fine tuned motor control is very poor. Both have continued to decline. In the past two years I’ve also started to break out in hives. Evidently Mast Cell Activation Syndrome/Disorder is a thing that is common with both EDS and Lyme Disease, and causes something called Histamine Intolerance. If I eat too much canned food, old food, smoked food, or stuff cooked on an old greasy grill, I will break out in hives all over my head and chest. Or, if I exert myself too much, like when we moved into a new apartment, I broke out in hives daily from unpacking. Nausea is now an everyday occurrence. I must eat small meals, and take nausea medications daily. I decided to enjoy myself last Thanksgiving and ate whatever and however much I wanted. A few hours later, I puked my brains out. For the past few years I’ve had sudden waves of tinnitus. More recently, I’ve started to get clicking in my jaw, and sometimes my jaw will shift and my left ear will hear everything as though extra loud, and like through a kazoo. Every joint pops and cracks. My neck and spine make grinding sounds. My right hand burns constantly. My right foot is pretty numb. the tendons in my left wrist slide out of place regularly, and my left knee has started to threaten to do something similar. The heart murmur is no longer denied by any doctors, and seems to have graduated to an occasional flutter. My veins will sometimes grow painful and bruise with no provocation but normal average human movement. I get trigger point injections (where they inject your muscle knots with numbing agent) regularly. I’ve gotten radio frequency ablation (where they sever the nerves that are being crushed between your vertebrae) and a few cortisone injections into my spine. I was starting the process of going to doctors and getting my spine finally surgically fixed, when the head pressure came back hard. Persistent Lyme is difficult to treat in an otherwise healthy person. In someone with a genetic disorder with auto-immune properties, it’s worse. Unfortunately, having any major procedures while still having Lyme isn’t recommended, as the Lyme will take any opportunity of weakness to resurge, and a major surgery would reverse any progress I may have made. I’ve been on antibiotics for over six years, now. I now question if it was indeed Lyme Disease that caused the sudden headache in the first place, or if it was a CSF leak, which is common in people who have connective tissue disorders, especially when they’ve had spinal taps which may not have healed properly (like my own). Doxycycline increases CSF pressure, so perhaps that’s why the medication works for me. I’d sent my many MRIs and tests to a Chiari specialist in NYC, but once again was told that Chiari is not the problem. The reason for my right side slowly weakening is still without a clear cause. 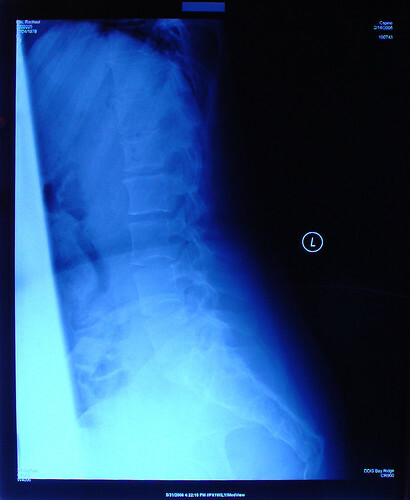 I can only pursue spinal fusion and hope it will relieve some of my symptoms.